What is a Parallel section? The Parallel element is to represent a bunch of concurrent threads that are started at entering the Parallel element and waited for at the end of the Parallel element, i.e. the Parallel element is not left before all launched threads have terminated their respective algorithms. This way, the Parallel section contains a synchronisation. How should a Parallel section be formed? Currently, for many of the code export languages there is a strategy to convert Parallel elements into working multithreading code, e.g. C++, C#, Java, Python, Perl, and bash/ksh. 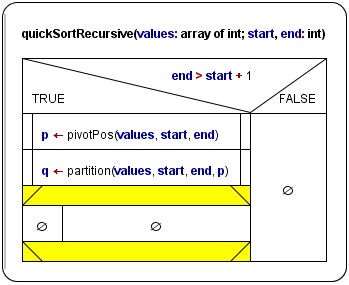 Usually, first worker classes or function objects are defined from the branches of the Parallel element, then for each of them a respective thread will be started, and after their termination has been awaited, variable values assigned inside the threads will be extracted from them for further use in the main thread. For target languages not supporting multithrading (e.g. for C there is no system-independent thread support in the standard libraries) or without accomplished generator support, the code export just serializes the branches of the Parallel elements but marks them with eye-catching comments, such that the user might try herself to find a concurrent solution. 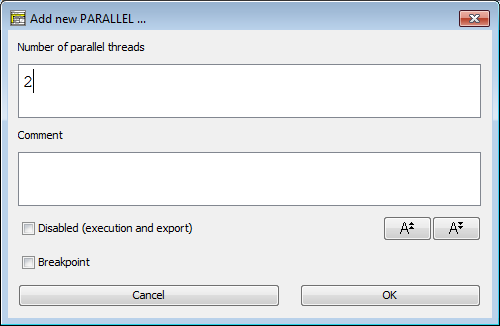 By the way, the Executor will not actually be able to run the threads in parallel. Instead, it will try to simulate concurrency by randomly choosing due instructions from the pool of still unterminated threads, but this will not go deeper than just the first instruction sequence level. Hence, loops, calls etc. will always be executed completely in sequential mode before the thread has to yield control to another waiting one. How do you add a Parallel element, now? 1. 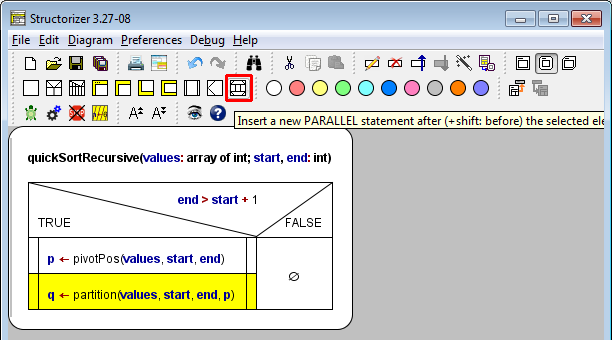 Select the element before or after which you want to insert a Parallel element. 2. Click the respective item in the context menu or the toolbar button marked red in the image (while optionally holding down the <Shift> key). 3. When the Element editor opens, just write the number of parallel threads into the text field, no more, no less. Only a constant cardinal number will work here. For any kind of explaining text, use the Comment text area. The execution order of the green and the cyan calls will be randomly chosen.